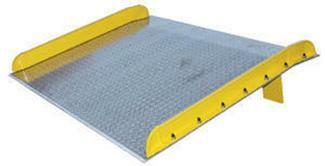 If you are looking for the perfect dock board, you have come to the right place. The dock allows the fork lift driver to move and perform various actions such as setting or retrieving the dock plate without having to abandon the seat of the forklift which saves time and enhances productivity. The board can be scooped and moved to and from the dock quickly and efficiently. The construction is welded steel which is helpful in eliminating damage, while problem-free entry and exit are also facilitated. 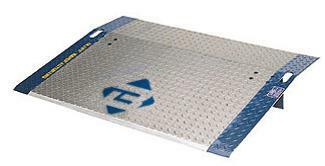 There is a safety stop that is fit between the truck and the dock and therefore is never prone to shifting under pressure. This is a long-lasting durable and versatile product that will enhance productivity and save you a lot of work hours. As an added bonus you get added safety because the driver doesn’t have to leave the forklift cab for any reason using this machine.
" We've made another order and are totally satisfied with the cost efficient machines of this overhead door company in Toronto. Will recommend this company with confidence. Thanks a lot and keep it up! "